Together with Wimbledon, the Australian Open and the US Open, the French Open is one of the four events that together are known as the tennis 'Grand Slam'. 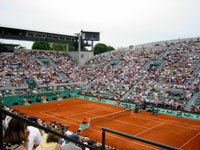 The tournament has become the most highly prized clay court title in the world and one of the biggest sporting events in France. Besides the best tennis players in the world, the stadium is also the place to be seen for the fashion conscious. The big matches are packed with celebrities and the vibe in Paris is thrilling. Even those who are not big tennis fans shouldn't miss the chance to attend a match and soak up the atmosphere if in Paris during the tournament.